Dogs have always been a huge part of my life, and after completing a 5 year BSc (Hons) in Canine Behaviour & Training in 2012 I started to plan a future with them as a career too. My real love is for German Shorthaired Pointers; I adore their beauty, their intelligence, their athleticism and the fact that mud doesn’t seem to stick to their short coats! I’ve had them for over 10 years now and currently have three (Sebbi, Freyr and Prussia), All of them run in harness but Prussia is my real super-athlete at the moment. I have a Specialized Hardrock bike and an American Pawtreck scooter. Paul, my husband, made my first scooter 10 years ago now, for Loki, a huge boy we were to lose to epilepsy. Later on I saved up and bought a dryland rig from Steel Dog. 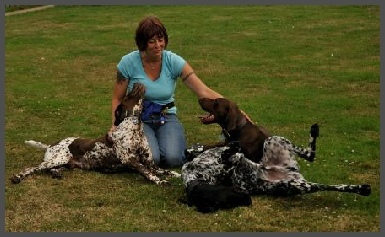 I ran Sebbi and Freyr as part of my Advanced Dog Training module at uni, having to control them by voice only to start, speed up, slow, stop, turn left, right, move over and turn around. No brakes allowed. Nowadays the control I have over my dogs is much, much less! 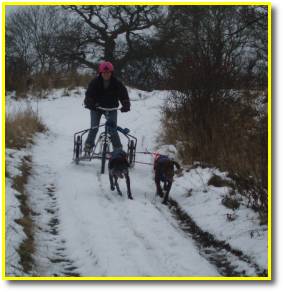 I have done some canicross but love the speed of scootering and bikejor. I’m now becoming very interested in canine fitness and nutrition and have just been accepted on an MSc in Veterinary Physiotherapy, which is so exciting! This will be my second competitive season, which is nerve wracking, exciting and exhilarating.